Atas Nama Tuhan kami menjawab email Anda kepada kami. Terima kasih atas perhatian Anda kepada kami. Betapa kami pun menyadari bahwa kami bisa saja membuat website baru, tapi itu bukan cara kami menghadapi pemblokiran oleh Kemenkominfo, karena kami ini tidak bersalah. Situs kami tak pernah berkonten negatif, karena yang kami rilis selalu adalah Wahyu Tuhan. Maka dalam hal ini, kami tidak diperkenankan Tuhan membuat website baru, pun juga mengeluhkan (protes) atas pemblokiran Kemenkominfo tersebut, karena pemblokiran oleh Kemenkominfo itu sudah menjadi Urusan Tuhan. Maka tidaklah menjadi hak kami mengurusi pemblokiran tersebut, melainkan adalah hak Tuhan secara langsung. Betapapun yang terblokir adalah Wahyu-wahyu Tuhan. Karena menurut Tuhan, pemblokiran terhadap Wahyu-wahyu Tuhan di Indonesia adalah merupakan penggenapan kekualatan Pemerintah Indonesia terhadap Tuhan yang sudah pernah mengkriminalisasikan penyebaran Wahyu-wahyu Tuhan, sehingga Eden dipidanakan dan divonis bersalah. Tentang Sikap Tuhan terhadap pemblokiran website Eden oleh Kemenkominfo tersebut, sesungguhnya Tuhan sudah memberitahukan kepada kami bahwa adalah mudah bagi-Nya untuk mengadakan anomali satelit telekomunikasi, semudah Kemenkominfo memblokir website Eden. Maka sesungguhnya hal ini pun merupakan pengajaran yang berharga bagi siapa-siapa yang salah dalam menyikapi Pewahyuan Tuhan di Eden. Bahwa tiadalah Tuhan membiarkan Wahyu-wahyu-Nya dilecehkan sehingga website Eden diblokir dengan alasan yang sungguh tak patut karena dinilai sebagai situs yang berkonten negatif. Demikian Pembalasan Tuhan menjadikan tanggungan Kemenkominfo sangat berat, yang mengakibatkan beribu-ribu ATM dari beberapa Bank yang offline karenanya. Dan Kemenkominfo terpaksa harus membeli satelit baru. Semua orang selalu tak pernah menduga apa Pembalasan Tuhan terhadap suatu kesalahan terhadap-Nya, tapi kamilah yang diberitahukan mengenali asas hukum Pembalasan Tuhan melalui hal-hal yang kami hadapi itu. Demikian apa pun yang kami jelaskan pada Anda sekarang ini, tapi itulah suatu nilai perbandingan yang bisa disimak maupun bila ingin diperdebatkan. Betapa kebenaran hakiki selalu bisa tampil di antara peristiwa-peristiwa yang seperti ini. Yaitu bila peristiwa itu berkenaan dengan Pewahyuan Tuhan yang kami terima dan yang kami rilis ke masyarakat. Adapun kami ini masih bisa berkegiatan merilis Wahyu Tuhan karena website Eden masih bisa bebas diakses orang dari luar negeri dari negara mana pun. Juga dapat diakses oleh peminat di Indonesia melalui penggunaan proxy server di luar negeri, VPN (Virtual Private Network) atau menggunakan ISP (Internet Service Provider) lain yang tidak memblokir website Eden. Kepada ISP yang tidak memblokir website Eden, kami ucapkan terima kasih. Semoga Tuhan memberkati. Tapi kami pun juga punya channel Eden the Heaven di Youtube, maka kami tetap sibuk merilis Wahyu Tuhan, sampai Tuhanlah yang akan membuka pemblokiran website kami, karena Tuhan niscaya punya cara atas hal itu. Maka kami hanya tinggal menunggu apa yang akan terjadi ketika Tuhan serius ingin menghentikan pemblokiran situs Eden. Tapi terima kasih atas perhatian Anda. The Eden site is being blocked by the Ministry of Communication and Information since July 13, 2017, hence Eden’s good friends in Indonesia could access the Eden’s release through channel Eden the Heaven in Youtube. Hereby, we convey that this Eden’s release is the continuation of the revealment of the secret of Chapter An-Najm and Chapter Ya-Sin, however within it there is God’s Oath, which States His Warning About the Threat of Nuclear War, that this time is in quite critical condition, since harsh threat has been responded by harsh threat between Donald Trump and Kim Jong-Un. According to God, nuclear war has been recorded that it is going to happen. And the impact is extremely bad for the world. Thus, there are God’s Stipulations upon that matter that we release in this Eden Discourse. Unto the public, the reader of Eden site, we only want to state that truly, we all in Eden impossibly withdraws ourselves just because the blockage of the Eden site by the Ministry of Communication and Information. We must continuously deliver Revelation in any condition, for we bear the duty to convey God’s Revelation to the world and for the sake of world peace. And unto the world public who could still access the Eden site, we also hope that the world public heeds well God’s Oath, which is the most sacred and most sacrosanct, that we deliver now, so the public who knows about God’s Oath could share it with the competent people in their authority in their own country. So that God’s Oath, which we receive just recently, its benefit could be realized aiming to prevent the occurrence of nuclear war. Thus, this is the introduction of Eden Discourse that we are releasing now, hopefully the public is willing to see the Eden Discourse, which is released by the Eden site, as God’s serious Help, and hence certainly the content of Eden site is not the site with negative content. Thank you for your attention unto our site. The lyric of this song has been given to us by His Majesty the Holy Spirit quite a while ago, which was in 2000, yet it was just sung in 2014 by Ietje Ridwan. However, the song is only suitable with the recent condition of the world, in 2017. Then we need to update the illustration of video clip of The Great Day song, so the context becomes more precise with the lyrics of the song that has long been established. Thus, Archangel Jibril the Holy Spirit always brings us to look at the future in the on-going period of time. The world chaotic condition due to nuclear war, which possibly happens as the consequence of the escalating threat thrown by Donald Trump and Kim Jong-Un to each other lately; as for in God’s ‘Eyes’, that moment is seen by Him as the trigger of doomsday becomes stronger and could end in its totality. Nevertheless, this matter has been continuously warned by God to the world. God’s Warning regarding the nuclear war disaster has been written since the writing of the book Perkenankan Aku Menjelaskan Sebuah Takdir (Let Me Explain a Destiny), which I wrote in 1998. At that time, the world was still fine, there was not yet global warming, however, I have been brought by Archangel Jibril to see that issue, and I wrote it down. 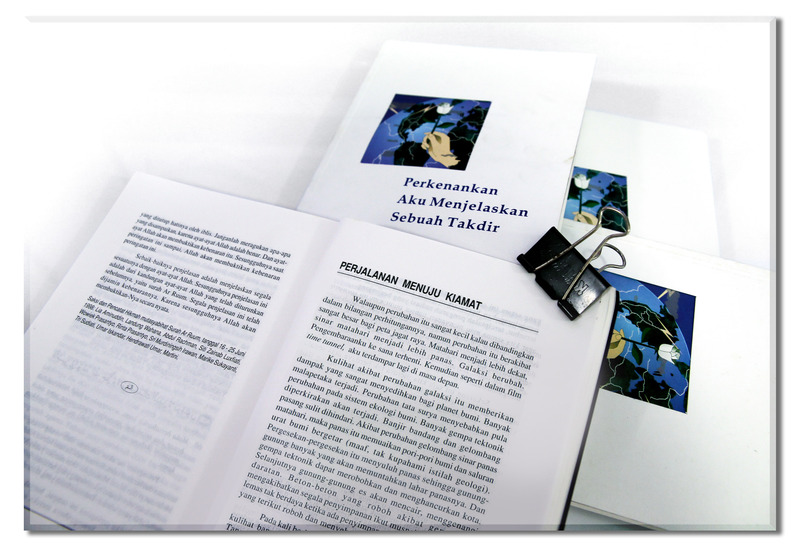 And this is the format of the book Perkenankan Aku Menjelaskan Sebuah Takdir, which inside contains chapter Perjalanan Menuju Kiamat (the Process to Doomsday). And as for the warning about the happening of doomsday from God, we never recede informing about it. And as for that God’s Warning, it is repeated over and over by Him until this latest release of Eden Discourse. And this is the result when God’s Revelation is continuously neglected. Nevertheless, not a single man feels guilty for rejecting and neglecting God’s Revelation. We, the Eden Community just recently celebrated the 70th birthday of Her Majesty Lia Eden on last August 21, 2017. Unexpectedly by all of us, that on the day of Her Majesty Lia Eden’s birthday turned out God descended down His Words especially directed at Her Majesty Lia Eden, and that God’s Words, which included His Oath, it turned out that it was a special blessing for Her Majesty, since the miracle of the three titles of queenship of Her Majesty was granted on that day. Surely that incident is immeasurably valuable for us all, how we expect not that Her Majesty Lia Eden’s 70th birthday actually was the blessing of miracle from God, which the value is immeasurable. And we all are grateful, for it means a full protection for Eden from God. From the meaning of that celebration, then it is the first time that we specially release the celebration of Her Majesty’s birthday. Particularly, what is most important for us is the existence of a very special God’s Oath and His Words on the day of Her Majesty Lia Eden’s birthday, which before the celebration we were obliged by God to take a vow of willingness to be taken our lives by God, if we still make mistake. Thus, Her Majesty was commanded by God to take a vow not to make any mistake whatsoever. Actually, when we were commanded to take such vow, we realized not that God would take His Oath at Her Majesty’s birthday celebration. And so, we have just known what meant in holding the vow taking on the day of Her Majesty’s birthday. It turned out that it was a preparation in facing the moments that will come, which is stated by God as the moment where the world will go through the hardest time, since it is most likely that the nuclear war will break out. And it will create a chaotic world. Thereof, we are prepared by God to face all heavy difficulties that will rise later through the procession of the vow taking that we have just performed under His Stipulation. And for the sake of the tenacity of faith and resilience in purifying ourselves, we recently took a vow unto God through the procession of vow taking on Her Majesty’s birthday, on August 21, 2017. Thus, we release completely God’s Oath and His Revelation, as well as His Majesty the Holy Spirit’s edict on Her Majesty Lia Eden’s birthday. Nevertheless, we present our release to the public for the sake of showing the official Divine procession, which is obliged by God for us to carry out before the public, in order to provide a teaching related to the principle of God’s Law upon His Heaven. Kami Komunitas Eden baru-baru ini merayakan hari Ulang Tahun Paduka Bunda Lia Eden yang ke 70 pada tanggal 21 Agustus 2017 yang baru lalu. Tak diduga oleh kami semua bahwa pada hari ulang tahun Paduka Bunda itu ternyata ada Firman Tuhan yang khusus kepada Paduka Bunda dan Firman Tuhan yang disertai Sumpah-Nya itu ternyata merupakan karunia khusus bagi Paduka Bunda, sebab mukjizat ketiga gelar keratuan Paduka Bunda dikaruniakan pada hari itu. Tentu peristiwa tersebut tak terhingga berharganya bagi kami semuanya, betapapun kami tak menyangka bahwa hari ulang tahun Paduka Bunda yang ke 70 itu ternyata adalah karunia mukjizat dari Tuhan yang tak terhingga nilainya. Dan kami semua bersyukur karena itu berarti merupakan pengayoman sepenuhnya terhadap Eden dari Tuhan. Dari makna perayaan tersebut, maka baru kali inilah perayaan hari ulang tahun Paduka Bunda kami rilis secara khusus. Terutama yang paling istimewa bagi kami adalah adanya Sumpah dan Wahyu Tuhan yang sangat khusus di hari ulang tahun Paduka Bunda tersebut, yang mana sebelum itu kami diwajibkan Tuhan bersumpah bersedia dihukum mati oleh-Nya bila masih bisa tersalah juga. Demikianpun Paduka Bunda dititahkan Tuhan bersumpah untuk tidak melakukan kesalahan apa pun juga. Sesungguhnya ketika kami dititahkan bersumpah semacam itu, kami belum menyadari bahwa Tuhan pun akan memberikan Sumpah-Nya di acara ulang tahun Paduka Bunda. Dan demikianlah kami baru tahu apa yang dimaksud Tuhan dalam mengadakan persumpahan di hari ulang tahun Paduka Bunda tersebut. Ternyata itu merupakan persiapan dalam menghadapi saat-saat yang akan datang yang dinyatakan Tuhan sebagai saat di mana dunia mengalami masa-masa yang paling berat, karena sangat dimungkinkan terjadinya perang nuklir. Dan itu akan menyebabkan terjadinya chaos dunia. Untuk itulah kami dipersiapkan Tuhan menghadapi segala kesulitan berat yang akan muncul nanti melalui prosesi persumpahan yang baru saja kami lakukan atas Ketentuan-Nya. Dan demi ketahanan iman dan ketahanan bersuci, kami pun mengangkat sumpah kepada Tuhan melalui prosesi persumpahan di hari ulang tahun Paduka Bunda pada tanggal 21 Agustus 2017 baru-baru ini. Demikian kami rilis sepenuhnya Sumpah dan Wahyu Tuhan serta Sabda Paduka Ruhul Kudus di hari ulang tahun Paduka Bunda. Betapapun rilis kami ini, kami sajikan ke publik demi memperlihatkan prosesi-prosesi resmi Keilahian yang diwajibkan Tuhan untuk kami adakan di hadapan publik, demi untuk pengajaran terkait dengan Asas Hukum Tuhan terhadap Surga-Nya.